A 1914 advertisement for Sweet Caporal Cigarettes featuring “the famous $22,000 pitcher,” Marty O’Toole of the Pittsburgh Pirates. O’Toole’s contract was purchased by Pirates owner Barney Dreyfuss from the St. Paul Saints for $22,500, and along with his Saints teammate, catcher William Kelly became “The $30,000 Battery,” although the sum paid for Kelly remains in dispute and was anywhere from $5000 to $12,500 depending on the source. Whether it was because of his inability to smoke on the mound or not, O’Toole struck out just 300 battersin 599.1 innings over five major league seasons. 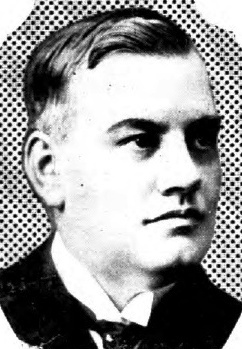 Max Carey’s parents wanted him to become a Lutheran minister, in 1917 the Pittsburgh papers suggested that he was trying to become an attorney. 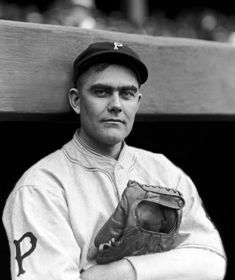 Carey, from his home in St. Louis, informed Pittsburgh Pirates owner Barney Dreyfus in January that he was a free agent. The Pittsburgh Press said the reason for “Carey’s outburst” was the contract “did not contain that section known as ‘Clause 10;’” the Pirates had omitted the Reserve Clause from the contract, and Carey proclaimed himself a free agent. On March 14 it was reported that Dreyfuss sent him a contract calling for $5000, the same amount he received in 1916, The Press noted that “No letter accompanied the contract,” and that Carey returned only the signed contract, suggesting that the relationship between Carey and Dreyfuss was strained. He had a solid season after his foray into free agency, he led the National League in stolen bases for the third straight year and hit .296 for the 51-103, eight place Pirates. Carey signed for $5000 again and was named captain of the Pirates, replacing the retired Honus Wagner. With light standards set up just behind the first and third base coaching boxes, the Homestead Grays and the Kansas City Monarchs took the field for the first night game at Forbes Field on July 18, 1930. The night before, the Grays played under lights for the time. A similar lighting system was deployed at the Akron, Ohio Central League ballpark, and Smokey Joe Williams shut out the Akron Guard, a local amateur club, 10 to 0, and held the Guard to two hits. “With 33 huge floodlights as illuminants, the play-field of the Pirates was turned from inky blackness into something approaching mid-afternoon brightness. “The scene was a revelation to many doubting Thomases who went to scoff and left the field declaring that perhaps, after all, the national pastime, if it ever has to be saved, will find night performances its savior. The game went 12 innings, and ended, The Press said, “Precisely at midnight,” when George Scales scored the winning run on a hit by catcher William “Buck” Ewing. The next night, Williams pitched in the second night game to played in Pittsburgh, he took a 4 to 3 lead into the ninth inning when Kansas City scored five runs and beat him 8 to 8. Two weeks later, Williams struck out 27 Monarchs batters under the lights in Kansas City. “The distance from the home plate to the backstop in Pittsburgh (Forbes Field) used to be a terrible strain on Larry in the hot weather. Every time a wild pitch or a passed ball got by him Larry would cuss out the man who laid out the Pirate plant. “One night (Pirates owner) Barney Dreyfuss was seated on the veranda of the hotel where the Giants were stopping. Larry had chased eight balls that afternoon. He approached Dreyfuss and tapped him on the shoulder. The price paid for Kelly remains a matter of dispute. The New York Times said he was acquired “for less than $5,000.” The Washington Post put the price at $10,000 while The Pittsburgh Gazette Times, The Pittsburgh Press and The Associated Press said it was $12,500. O’Toole posted a 24-27 record from 1911-1913. He struggled in 1914, and with a 1-8 and record and 4.68 ERA in August, he was sold to the Giants, in 10 appearances with new York he was 1-1 with a 4.24 ERA. Dreyfus’ “$22,500 Beauty,” was done as a major leaguer at 25 years old, seven months after the ad appeared. He played four more seasons in the American Association and Western League; his professional career was over before his 30th birthday. Kelly played four years in Toronto, hitting .227 in 280 games; his professional career was over at age 31. 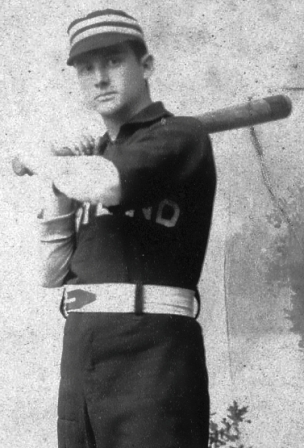 Nicholas “Nick” Maddox burst on the National League scene in 1907. Born in Maryland on November 9, 1886, Maddox’ was born Nicholas Duffy, but adopted his stepfather’s name Maddox. In 1906 the 19-year-old was given a trial in the spring with the providence Grays in the Eastern league. He was released before the season began and signed with the Cumberland Rooters in the Pennsylvania-Ohio-Maryland League (POM). Maddox had played in 1905 for the Piedmont team in the semi-pro Cumberland and Georges Creek League. Maddox spent most of 1907 with the Wheeling Stogies of the Central League. He posted a 13-10 record and no-hit the Terre Haute Hottentots on August 22. Maddox was purchased by the Pirates the following month and made his big league debut on against the St. Louis Cardinals. Maddox shut the Cardinals out on just five hits, struck out 11 and got his first hit, a single in his first at bat. The rookie started six games Pittsburgh, won his first four, and finished with a 5-1 record with a 0.83 ERA. 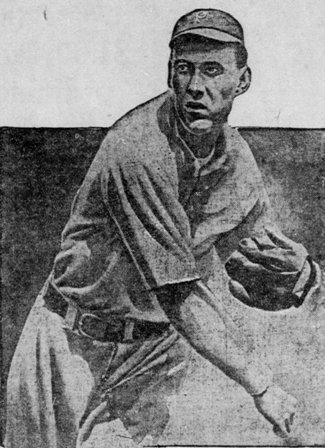 The Pittsburgh Leader said Pirates’ President Barney Dreyfuss claimed Maddox would be “the sensation” of 1908. He wasn’t far off. The 21-year-old was an impressive 23-8 with a 2.28 ERA with five shutouts. Despite his success there was concern about control—he walked 90 batters while striking out just 70 in 260 innings, and hit 11 batters. The Press also said he would “start out with good control” based on his performance in March games in Hot Springs, Arkansas. The Pirates lived up to expectations, taking over first place on May 5 and cruising to the pennant; Maddox did not. The 22-year-old struggled for the first half of the season. The Leader said he was having “a hard time getting into condition,” and was wild as a March Hare.” Maddox got on track in July pitching a 2-hit shout against the Cincinnati Reds on the 6th, and four-hit shutouts against the Brooklyn Superbas and Boston Doves on the 14th and 23rd. He ended the season 13-8 with a 2.21 ERA—overshadowed by teammates Howie Camnitz (25-6), Vic Willis (22-11), Albert “Lefty” Leifield (19-8) and rookie Charles “Babe” Adams (13-3 as a reliever and spot starter). Despite going into the World Series against the Detroit Tigers with such a strong pitching staff, Manager Fred Clarke opted for the rookie Adams in game one and he responded with a 4 to 1 victory. The Tigers beat Camnitz 7 to 2 in game 2. “I was in an awful predicament. Adams had been used up. It was had been raining, and it was very cold. The chilly drizzle was something frightful. The ball would get wet and water-logged and the problem was to get a pitcher who could handle the wet ball. I looked the gang over. Adams was out of the question. He had been used up. The Pirates took a 8 to 4 lead into the ninth–Detroit scored two more runs, helped by another error—but Maddox held on and picked up the win. He did not appear in another game during the series. The Pirates won in seven; with Adams picking up complete game wins in games five and seven. 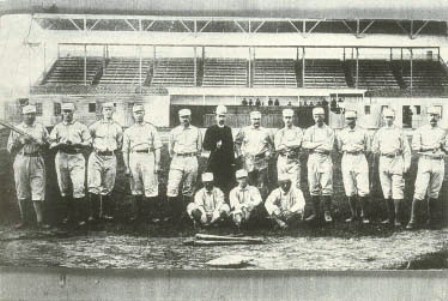 1909 World Series Champion Pirates, Maddox is ninth from left. He never “rounded into form.” Maddox struggled all season. He started just seven games, pitched in relief in 13 others, and was 2-3 with 3.40 ERA. By August, with the Pirates in second place, six games behind the Chicago Cubs, The Pittsburgh Gazette asked “what was the matter?” with Maddox and why the Pirates had not cut him loose. He made his last appearance on September 12, giving up a run, a hit and walking two batters in two innings of relief during a 4-0 loss to the Reds. He was sold to the Kansas City Blues in the American Association 10 days later. Maddox won 22 games for the Blues the following season, but continued to be plagued by wildness and arm trouble. His major league career was over, and he was finished professionally in July of 1914 at 27-years-old when he was released as manager and pitcher for the Wichita club in the Western League after posting a 3-13 record. Maddox, who lived in Pittsburgh, and worked for the Fort Pitt Brewing Company, after his retirement, lived long enough to listen on the radio to the last two innings of the next no-hitter thrown by a Pirate pitcher—Cliff Chambers defeated the Boston Braves 3-0 on May 6, 1951. Nick Maddox died in 1954 at age 68. “John T. Brush—The smartest man in baseball, but vindictive. Garry Herrmann—Smart, but no backbone; the last man to him has him. Ban Johnson—Bluffs a great deal and makes it stick. Likes to talk. Charles Comiskey—Shrewd as can be. Connie Mack—Shrewd and clever; knows the game better than anyone. Charles Murphy—A hard fighter, but backs up at times. George Tebeau—More nerve than any other man in baseball, very shrewd. Barney Dreyfus—Smart, but always following, never leading. The Cleveland Herald was not happy when pitcher Jim McCormick jumped his contract with the Cleveland Blues in the National League to the Union Association’s Cincinnati franchise. Although teammates Jack Glasscock and Charles “Fatty” Briody also jumped to Cincinnati, the paper saved most their anger for the first big leaguer to have been born in Scotland. 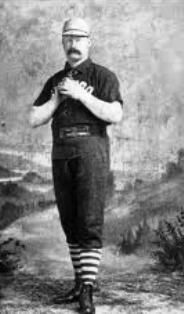 McCormick was 21-3 with a 1.54 ERA in 24 games and helped pitch the “Outlaw Reds” to a second place finish in the struggling Union Association. After the Association collapsed was assigned to the Providence Grays, then was sold to the Chicago White Stockings. From July of 1885 through the 1886 season McCormick was teamed with his boyhood friend Mike “King” Kelly—the two grew up together in Paterson, New Jersey and were dubbed “the Jersey Battery” by the Chicago press—and posted a 51-15 record during the season and a half in Chicago, including a run of 16 straight wins in ‘86. The pitcher who The Herald said would otherwise be a $12 a week bartender also used some of the money he made jumping from Cleveland in 1884 the following year to purchase a tavern in Paterson. 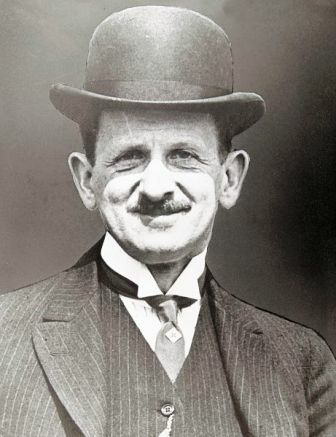 “The time was when a man who put his money into a club was quite sure of coming out more or less ahead, but that is past. When the National League had control of all the best players in the country a few years ago, and had no opposition, salaries were low, and a player who received $1,500 for his season’s work did well. In 1881, when the American Association was organized in opposition to the league, the players’ salaries at once began to go up, as each side tried to outbid the other. When the two organizations formed what is known as the National Agreement the clubs retained their players at the same salaries. “Several other associations were then organized in different parts of the country and were admitted under the protection of the National Agreement. This served to make good ball-players, especially pitchers, scarce, and forced salaries up still higher, until at the present time a first-class pitcher will not look at a manager for less than $3,500 for a season. (“Old Hoss”) Radbourn of last year’s Providence Club received the largest amount of money that has ever been paid to a ball-player. His wonderful pitching, which won the championship for the club, cost about $5,000 (Baseball Reference says Radbourn earned between $2,800 and $3,000 in 1884), as did the work of two pitchers and received the pay of two. “Some of the salaries which base-ball players will get next season are; (Jim) O’Rourke, (Joe) Gerhardt, (Buck) Ewing and (John Montgomery) Ward of the New York Club, $3,000 each. (Tony) Mullane was to have played for the Cincinnati Club for $4,000 (Mullane was suspended for signing with Cincinnati after first agreeing to a contract with the St. Louis Browns). (Fred) Dunlap has a contract with the new League club in St. Louis for $3,400. These are only a few of the higher prices paid, while the number of men who get from $2,000 to $3,000 is large. At these prices a club with a team costing only from $15,000 to $20,000 is lucky, but it has not much chance of winning a championship. To this expense must be added the ground rent, the salaries of gate-keepers, and the traveling expenses, which will be as much more. The Grays disbanded after the 1885 season. “The Popular Magazine,” a literary magazine that billed itself as a “magazine for men and women who like to read about men,” was published by Street & Smith from 1903 until 1931. In 1904, the magazine told the story of a fight the previous season involving New York Giants catcher Frank Bowerman. McGraw cornered Bowerman who insisted Clarke had told “the meanest lie that ever was told, and I told Jack Warner so, but he don’t believe it.” McGraw told him to keep quiet about it until the Pirates visited New York on June 26. “’Frank, have you got a good right swing?’ The Michigan Lumberman smiled grimly and clenched a fist knotted and as hard as Hercules’ war club. ‘Well, it’s up to you, then,’ advised McGraw, “to put life in the team. Don’t lose any time.’ Bowerman understood. “The Popular Magazine” story added an element that differed from the coverage in New York and Pittsburgh newspapers—while each town pointed fingers at the other (in Pittsburgh Bowerman was an out of control thug, while in New York, Clarke got what he deserved for stirring up trouble) no one else suggested that McGraw engineered the fight to motivate his club against the first place Pirates. The Giants weren’t able to catch Pittsburgh, finishing in second place six and a half games behind the Pirates. National League President Harry Pulliam initially announced that there would be no punishment for either player because the fight did not take place on the field, three weeks later, under pressure from Pirates owner Barney Dreyfuss, Pulliam fined Bowerman $100. No one was surprised that Dreyfuss’ protégé, team secretary Harry Clay Pulliam was named team president, nor was it surprising that Charles Dehler was retained as vice president. But no one had predicted the Colonel’s choice to replace Bill McGunnigle as manager. McGunnigle had succeeded John McCloskey, and the two combined for a 38-93 record and a twelfth place finish. James F. “Jimmy” Rogers would be a first-time manager; three months short of his 25th birthday and only 110 games into his major league career. The Courier-Journal knew so little about the new manager that the paper got his age and place of birth wrong, and also reported incorrectly that he had minor league managerial experience. Just why was he the right man to manage the team? Despite being “the best first baseman the Colonels ever had,” Rogers opened the season as the team’s starting second baseman; thirty-five-year-old minor league home run king Perry Werden, acquired from the Minneapolis Millers of the Western League played first base for Louisville. The team won five of their first seven games, and then went 12-22 through June 16 when Rogers was fired as manager and released; he was hitting .144 and made 16 errors in forty games at second base. Rogers was replaced as manager by Fred Clarke; the future Hall of Famer was two weeks shy of his 24th birthday. Pickering was released in July, signed with the Cleveland Spiders, and apparently recovered from his broken heart, hitting .352 in 46 games for Cleveland. Rogers would never play another major league game. He was signed by the Pittsburgh Pirates the day after Louisville released him, but became ill with the flu and never played for them. A month later he joined the Springfield Ponies in the Eastern League and finished the season with them. Rogers played for East Coast minor league teams until in August of 1899 when he became ill while playing with the Norwich Witches in the Connecticut League. The New Haven (CT) Register repeated the story about Rogers being hit by a pitch, and said that while that injury contributed to his death, he had died of Bright’s disease—a kidney ailment now referred to as nephritis. Rogers’ Connecticut death certificate listed the cause of death as a bacterial inflammation of the brain. Ernest Guy “Ernie” Diehl’s entire professional career consisted of less than 60 games. Every year from 1900 to 1911 he was offered contracts by professional teams and despite his time with two National League teams and two minor league teams he never earned a penny as a ballplayer. Diehl was born in Cincinnati in 1877, the scion of a Cincinnati distillery empire; His father Adam G. Diehl had made a fortune in the whiskey business with his brother-in-law; together they founded The Edgewood Distilling Company. He attended the University of Cincinnati and established a reputation as one of the area’s best athletes. 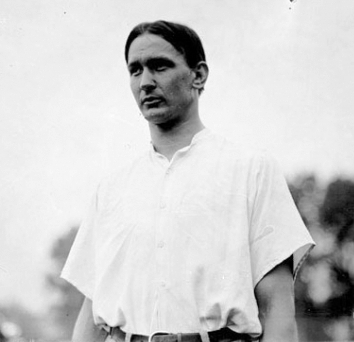 Perhaps even better at tennis than baseball, Diehl was a prominent amateur tennis player during the first decade of the 20th Century. 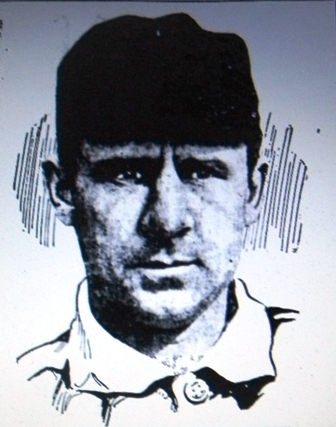 In May of 1903 when the Pirates arrived in Cincinnati for a series, the team was decimated with injuries and Diehl joined the team for one game, playing left field on May 31, he went 1 for three in a 3-2 pirate victory. Despite being offered a contract with Pittsburgh, Diehl chose to return to the distilling business and the Saturday Baseball League. In 1904, with several Pirate players hurt, Diehl was again asked to join the team; this time for 12 games. The Pittsburgh Gazette said Diehl also spent time with the Pirates in Hot Springs, Arkansas that spring. While he hit just .162 for the Pirates in 1904, that did not diminish Pirate owner Barney Dreyfuss’ desire to sign Diehl. Dreyfuss, and every other owner who offered Diehl a contract was unsuccessful in securing him for the 1905 season; Diehl spent the season playing in the Saturday League and in several tennis tournaments across the country. He again played tennis and semi-pro ball in 1906, until August when the Boston Beaneaters came to Cincinnati. 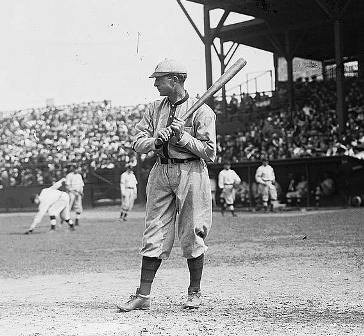 Shortstop Al Bridwell was injured, and Diehl was signed (again for no salary) to play for Boston in the three-game series. Just as he had in Pittsburgh, Diehl turned down an offer to stay with Boston for the remainder of the 1906 season. In addition to his business interests, amateur tennis and baseball career, and professional baseball “vacations,” Diehl also served on Cincinnati’s city council from, roughly, 1906-1910. Diehl then joined the eventual American Association champion Louisville Colonels, at the request of his friend and fellow Cincinnatian, manager Heinie Peitz. (Baseball Reference lists a player as “Diehl,” with no first name on the 1909 Louisville roster, with a .226 average in 20 games). The Sporting Life said Diehl “figured very prominently in Louisville’s winning the championship of the A.A. will again be in Colonel garb,” in 1910; Diehl did not play for Louisville, or any other professional team again. In 1911 The Associated Press and Cincinnati newspapers said the 33-year-old Diehl had a deal in place with Reds manager Clark Griffith to join the team at some point during the season; as with Louisville, that deal never materialized either. Diehl was briefly mentioned as a candidate to replace Griffith as Reds manager in 1912, the job eventually went to Hank O’Day. Diehl’s Edgewood Distilling Company seems to have been dissolved sometime around 1918, and he eventually settled in Miami where he died in 1958.